…We rely greatly on the sure operation of a complete blockade of the Atlantic and Gulf ports soon to commence. 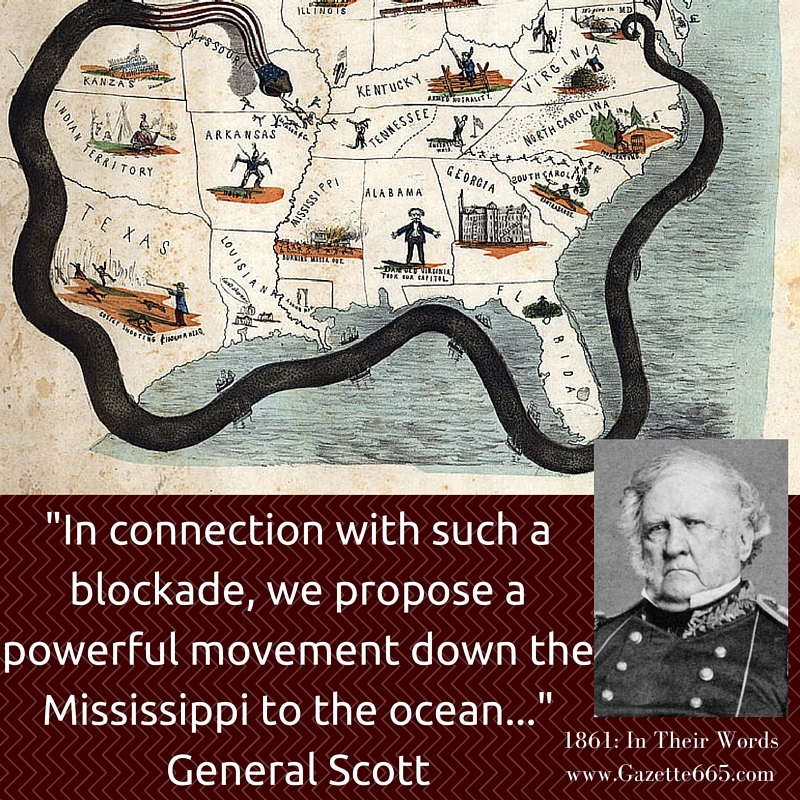 In connection with such a blockade we propose a powerful movement down the Mississippi to the ocean, with a cordon of posts at proper points, and the capture of Forts Jackson and Saint Philip; the object being to clear out and keep out this great line of communication in connection with the strict blockade of the sea-board, so as to envelop the insurgent States and bring them to terms with less bloodshed than by any other plan. I suppose there will be needed from twelve to twenty steam gun-boats, and a sufficient number of steam transports (say forty) to carry all the personnel (say 60,000 men) and material of the expedition; most of the gun-boats to be in advance to open the way, and the remainder to follow and protect the rear of the expedition, &c. This army, in which it is not improbable you may be invited to take an important part, should be composed of our best regulars for the advance and of three-years’ volunteers, all well officered, and with four months and a half of instruction in camps prior to (say) November 10. An antebellum image of New Orleans; General Scott’s plan would crush the Southern export/import economy and divide the Confederacy. The plan of controlling the seaboard and the major internal waterways – as outlined in General Scott’s letter – is known by the delightful (or nightmarish) term “The Anaconda Plan.” Taking an analogy from natural, it pictured a gigantic snake slowly squeezing the life out of a defenseless creature. Basically, that was Scott’s plan and strategy, but his snake would be the U.S. military and his “victim” would be the rebellious Confederacy. 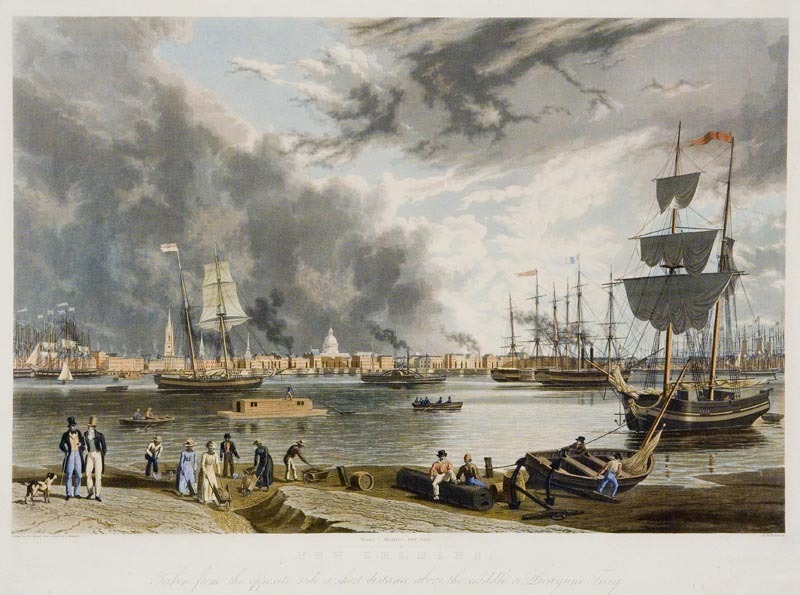 Lacking industrial factories and capabilities, the South relied heavily on the North and Europe for their imported supplies and luxuries in the ante-bellum era; they also exported the cash crops – mostly cotton and tobacco – which were a major part of the Southern economy. Scott realized this situation and determined that he could cripple the rebellious states by cutting off their trade/communication and ruining their economy. The next step would be military invasions of the South via the major rivers – ideally beginning with the Mississippi River and moving to the other waterways. This would effectively divide the Confederacy into pieces, isolating armies and chipping away at the secession territory. 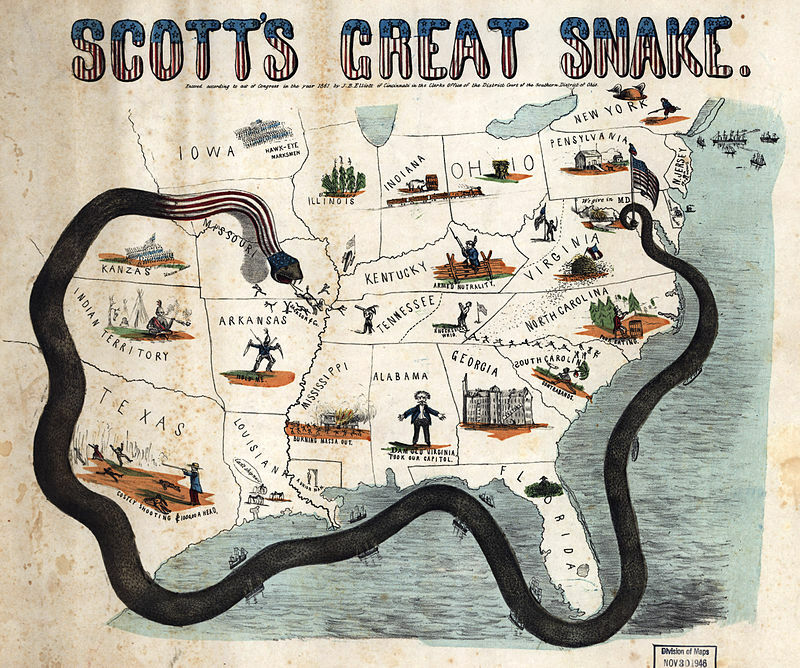 Ultimately, the Union Armies did employ Scott’s Anaconda Plan, but it was more complicated in reality than it appeared on paper. It wasn’t until 1862 that serious efforts were made in blockading and river expeditions. 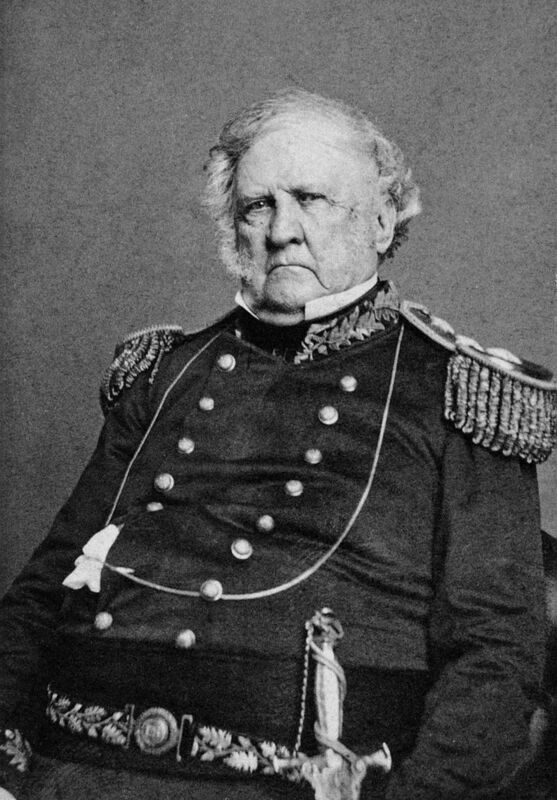 General Winfield Scott was born before the U.S. Constitution was written; in 1861, he was 75 years old. Establishing his military fame in the War of 1812 and the Mexican-American War (1846-1848), Scott became general-in-chief of the U.S. military. His nickname “Old Fuss & Feather” was acquired from his strict adherence to military discipline, appearance, and protocol. 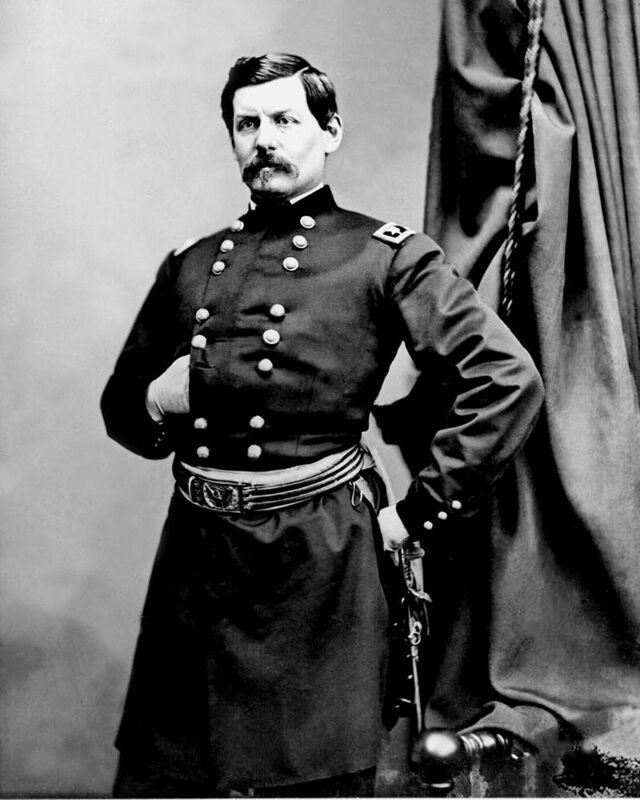 The recipient of General Scott’s letter was 34-year-old General George Brinton McClellan. A complete contrast to the older commander, McClellan was overly cautious, extremely ambitious, and mostly inexperienced. Time would prove that McClellan was fantastic at organizing armies, but a dismal failure at winning battlefield victories with his “perfect” army. McClellan considered himself a “Young Napoleon” – a genius of military knowledge with a penchant for fancy uniforms and public appearances. While he would cooperate with Scott to start the implementation of the Anaconda Plan, it does seem that McClellan breathed a sigh of triumph when Scott finally resigned. 1861 would be a positive year for McClellan, but 1862 would test his leadership abilities and reveal some major flaws. The suggestion and decision to blockade the Southern coastline was – arguably – one of the best strategies of the war (and was actually implemented by presidential order on April 16th). However, it presented a problem in 1861. The Union navy only had a handful of ships available for service. The blockade was a joke in the first year of war. But, everything has to start somewhere, and from those somewhat pathetic beginnings would emerging a chain of iron, steam, and wood that would encircle the Confederacy and drain its lifeblood – the economy of import and export. 1861 was just the beginning. P.S. Let’s play the “what-if” game… What do you think might have happened if Scott had not formulated and started the Anaconda Plan?